Step 1 Into a large pot, put the chicken breasts, chicken thighs, onion, one-half carrot, bay leaf and black peppercorns. Add the chicken broth and bring to a boil over high heat. Reduce the heat, cover and simmer until chicken is tender, but not quite done, about 15 minutes. Step 2 Remove the chicken from the broth. Let stand until cool enough to handle, then remove the skin and bones and cut the chicken into bite-size pieces and set aside. Strain the broth and skim off excess fat. You should have about 4 cups. Step 3Rinse and dry the pot from cooking the chicken. Add olive oil and heat over medium heat. Add the diced onion and carrots and saute until tender, about 5 minutes. Add the sliced chorizo and saute 2 to 3 minutes. Step 4While the chorizo is cooking, in a separate small saucepan, melt the butter over medium heat. Stir or whisk in one-third cup of the flour and cook, stirring constantly until smooth and bubbly. Simmer 2 to 3 minutes, then stir the roux into the vegetables with the chorizo. Stir in the 4 cups chicken broth. Step 5Raise the heat to high and bring to a boil, then reduce the heat to a simmer and stir until smooth. Season to taste with salt. Cook until the sauce has thickened, about 5 minutes. Stir in the saffron and chicken, cover and keep warm. Step 6Heat the oven to 425 degrees. In a large bowl, combine the remaining 1 cup plus 2 tablespoons flour, the cornmeal, baking powder and three-fourths teaspoon salt. Cut up the cold butter and add it to the flour and work it into the dry ingredients with a pastry cutter or by hand until the fat is evenly incorporated into the flour mixture. Stir in the minced thyme. Step 7Make a well in the center. Stir in the milk and quickly mix into the dough, being careful not to overmix. Set aside. Step 8Cover the bottom of a baking sheet with aluminum foil. Put six ramekins on the baking sheet and divide the hot chicken filling into the ramekins. 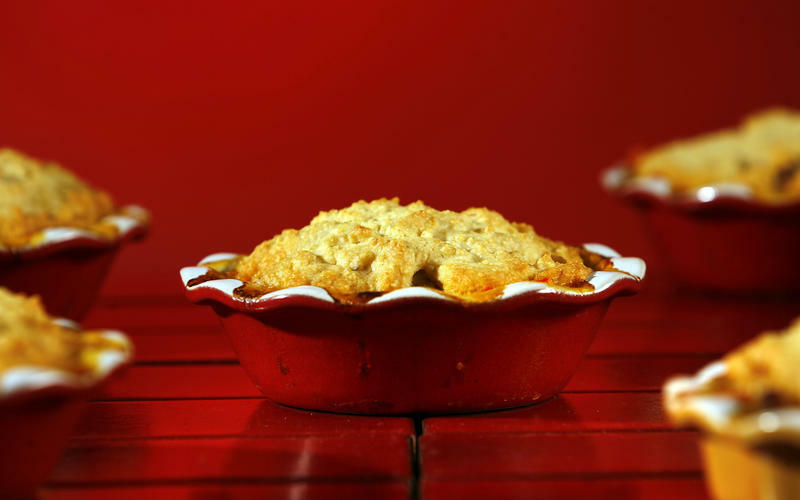 Top each of the pot pies with an equal amount of cornmeal topping. Gently spread the topping to within one inch of the edge. Do not smooth the topping but try to leave it lumpy for some texture. Bake until the cornmeal topping is browned and the dough tests done in the center, 20 to 25 minutes. Serve hot. In Recipes-list.com we have selected the most viewed recipes from category - Main courses . Enjoy the best recipes specially selected for you! Chicken pot pie espanola is the right choice that will satisfy all your claims.